New and exclusive for autumn 2018, Czechmate is an exotic hardneck garlic originating from Moravia in the Czech Republic. 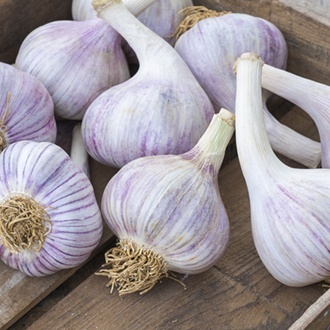 Trialled and bred by the team from the world renowned Garlic Farm on the Isle of Wight, it’s an autumn planting variety which is best planted in October but before January at the latest. Czechmate develops a glazed purple skin which thinly veils a beautifully striped purple bulb underneath, containing perfectly formed large, plump purple cloves packed tightly around a hardneck stem. Hot and spicy, it delivers a stronger flavour than most other UK garlics and has pronounced heat which is excellent for creating full flavoured dishes, an essential ingredient for Asian and Mediterranean cuisine. A vigorous variety, it has intermediate rust resistance.